Amapola Creek, 392 London Way, Sonoma. Tours and tasting by appointment only, 10:30am and 2pm; $25. 707.938.3783. In a standard cartoon gag, a mountain-climbing truth seeker strains to pull himself, at last, onto a ledge where sits a wise old guru, and asks a burning question. For instance, "What is the secret . . . to wine?" "There are no secrets in this industry," Richard Arrowood says. Looking forward to his 49th harvest in 2014, the life-long Sonoma County winemaker says that he's pleased to work in a field where peers cooperate more than they compete. Not that he doesn't have a few stories to tell. 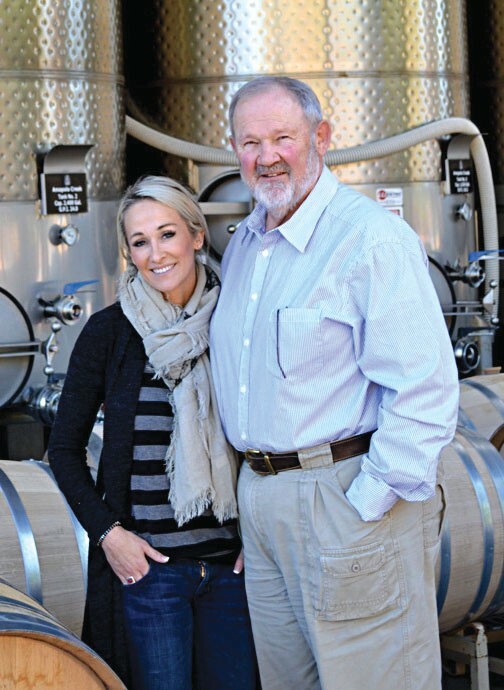 Arrowood (pictured with daughter Kerry Arrowood-Cummings) took a summer job during college at Korbel Champagne Cellars in 1965 and was the first winemaker at Chateau St. Jean in 1974, holding that job until 1990. With his wife, Alis, he founded an eponymous winery in 1985, attracting the attention of the then-expanding Robert Mondavi Corporation in 2000. "Leave him alone," Arrowood recounts Robert Mondavi telling his business partners while tasting his wines. "Give him everything he needs." But the corporate owners that subsumed Mondavi peddled Arrowood Winery off to a bankruptcy-bound investment group. When they declined to pay him for his estate grapes, says Arrowood, he took a hike up to his mountain redoubt in the chaparral—taking the wines that he'd made with him. Thus began Amapola Creek, perched on a ledge in the hills above Sonoma. Amapola Creek is a certified organic grower and handler, and says so on the label—unlike many other organic producers (shy much, folks?). The 2012 Belli Vineyards Chardonnay ($45) has aromas of candied nuts, peach and pear, with a Meyer lemon meringue-pie flavor and a finish of flat (in a very good way) Champagne. "Port-like Zin is not my idea of a good time," Arrowood says, and indeed, his 2010 Monte Rosso Sonoma Valley Zinfandel ($42) finishes with lingering, chewy dryness after sweet notes of jammy, raspberry fruit. Plush yet dry, this Zin is an enigma until I read the technical information and respectfully ask, something to the effect of, "Are you kidding, Mr. Arrowood?" This wine has a pH of 3.12 while boasting 15.5 percent alcohol. That's correct, he says with a smile. Technical story short, this wine suggests that simplistic slogans about low alcohol being the only path to "balanced" wines may beg reconsideration. The 2010 Cuvée Alis ($48), an estate-grown Syrah and Grenache blend, evokes the perfume of dried red roses and smacks of savory-tinged strawberry and licorice. When past masters of Cabernet get serious about blends like this, it's a good sign for the category. As for Arrowood, he's happy to be able to focus on what matters to him the most. During harvest, he says, he does more winemaking than paperwork.